Sometimes you just need a promotional coffee mug that oozes style while still remaining a classic design. The Belle Porcelain Mug is perfect for your clients who work in the corporate world and need stylish coffee mugs around the office. 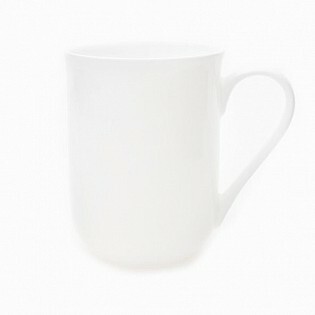 The Belle Porcelain Mug is a bright white promotional mug and is suitable for a range of promotional campaigns or ongoing branding opportunities. Due to the style of the mug, they are also perfect for use in cafes and restaurants when you need something different to the traditional style café crockery. When looking for a promotional coffee mug, companies are often after a product which will help their logo and marketing message stand out. The Belle is a great choice for this; with a 330ml capacity and a white background, your logo print is certainly going to stand out. Even better is that the Belle Porcelain promotional mug is budget friendly, so you receive a great looking mug without breaking your marketing budget. Companies often choose a standard coffee mug for their promotional campaigns, thinking that the stock-standard style will suit everyone. While that is correct, the point of a promotional mug is choosing one that everyone will love, and then use. In turn, this shows off your brand to people who may never have heard of your company. The Belle is a popular promotional mug with a range of clients. The flared lip and heart-shaped, easy to hold handle mean that it is a great choice for any of your clients or customers, while the style and quality porcelain material provide a quality, good looking mug. If you need a good looking but traditionally styled quality promotional coffee mug, you can’t go past the Belle.